The official launch of the new daycare center building took place on September 9, 2016. From left are MyungHee Lee of Parent Representatives, MyungHee Lee and SooHyun Kim, Principal DeokJu Yoon of UNIST Daycare Center, UNIST President Mooyoung Jung, Auditor Sung Euk Lee of UNIST, Vice President JaeSung Lee of UNIST, Dean Kyoo-hwan Kim of Administration at UNIST, and Manager SangJoon Park of Hyundai Engineering & Construction Co., Ltd.
UNIST is the only S&T specialized institution and the third university in the nation to receive the recognition. UNIST has announced that it has recently been selected as a family-friendly certified institution of 2016 by the Ministry of Gender Equality and Family. Among the nation’s four S&T specialized institutions, UNIST is the only university to receive the recognition. The ‘Family-friendly Certification’ is granted to corporations and public institutions whose policies make it possible for employees to more easily balance family and work, and to fulfill both their family and work obligations. Every year, companies and public organizations are evaluated on the family-friendly benefits they offer, including the establishment of workplace childcare support, flexible work arrangements, as well as a family-friendly corporate culture. In September 2015, UNIST has been assigned to a public institution specialized in science and technology. UNIST has been named a family-friendly certified institution of 2016 for creating work environments that make it possible for employees to be both good workers and good caregivers. The operating of workplace daycare center and the expansion of faculty housing are some examples of the family-friendly policy, being implemented throughout the campus. The UNIST Daycare Center provides high quality, affordable childcare that is responsive to the needs of families within the community of UNIST. Moreover, the recent completion of its new building, the center allows increased enrollment capacity to help their employees harmonize work and family life. Since its establishment in 2009, UNIST has been providing the finest workplace childcare facilities and family-friendly work environment that is rich in diversity, inclusive, and supportive of all students, faculty, and staff. 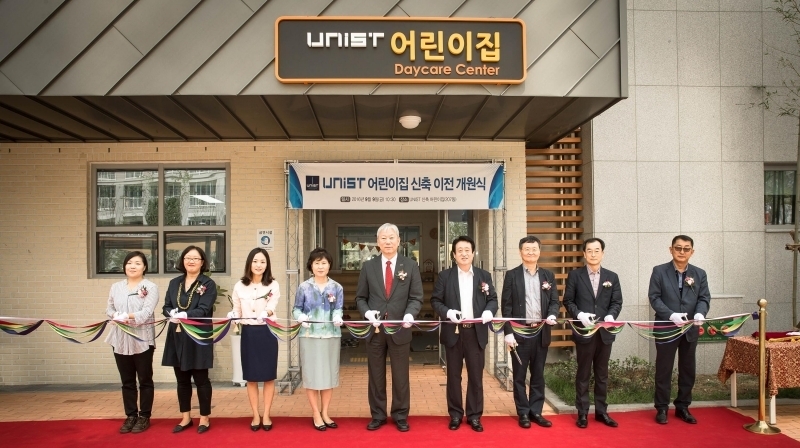 In additions, UNIST has been also providing their employees with the following benefits: employee health insurance, medical care expenses, education expenses of children, family-friendly workshops for working parents, maternity leave, childbirth congratulatory money, as well as counselling program.